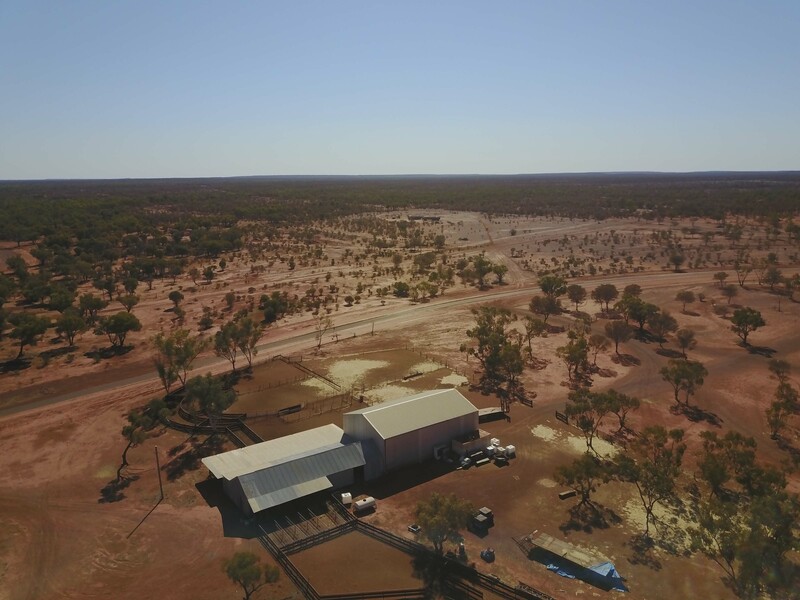 Alroy Station is a sheep and cattle station on the road from Eulo to Quilpie. 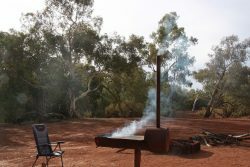 Mac and Mary, the owners have set up a bush camping area with fireplaces (wood supplied), water taps, kitchen area, a couple of septic toilets and showers. They also have an artesian spa set up in a cut down fibreglass water tank. Plenty of space but unlikely to be crowded. It was 3 °C inside the caravan this morning so I was glad to have the diesel heater, which I started and opened the shower door so I could have a comfortable shower when I got up. 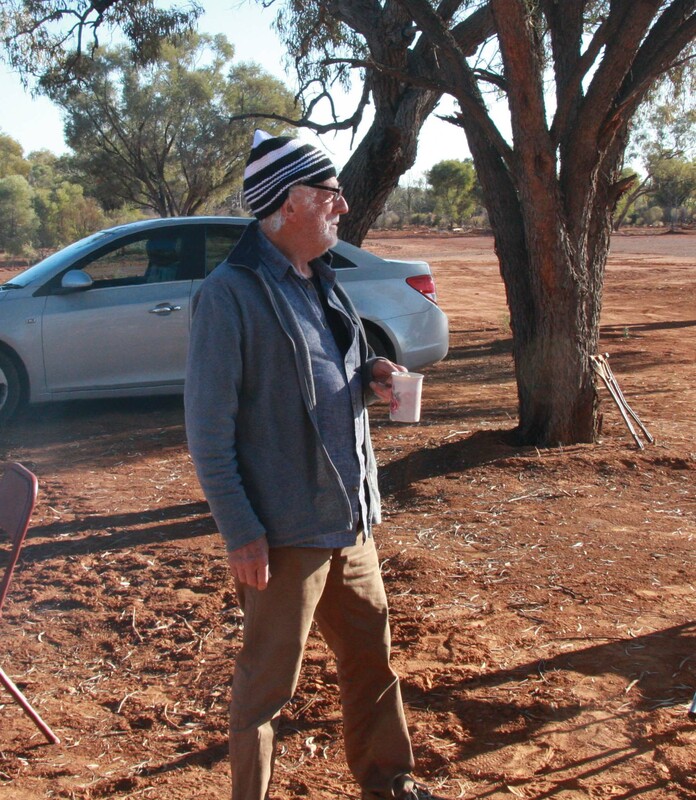 I have one other camper here and we had a good chat today, he lost is wife 4 years ago, so we had a lot in common. Her name was Margo, but commonly called Margie, so that was a coincidence. He was lovely, empathetic and was more composed than me in discussing our loss that we both feel deeply. He travels alone in a small car, which he sleeps in and is visiting places he has visited before with his wife. I visited Yowah, an opal town nearby. A complete mess just like every other opal town I have ever visited. Discarded equipment all over the place, junk, rough built houses and lots of places to buy opals. 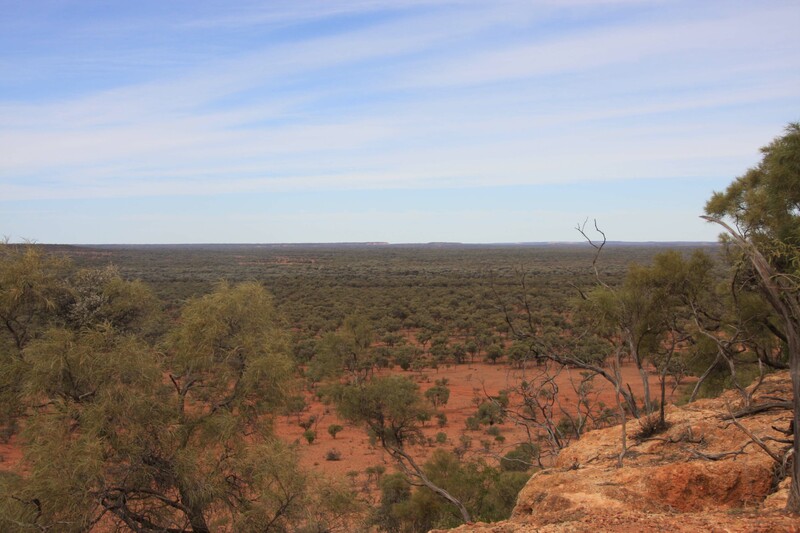 I visited the Bluff, a rocky outcrop 4 Km from town about 50 metres above the plain. It was worth the visit and it provides extensive views over the surrounding country. 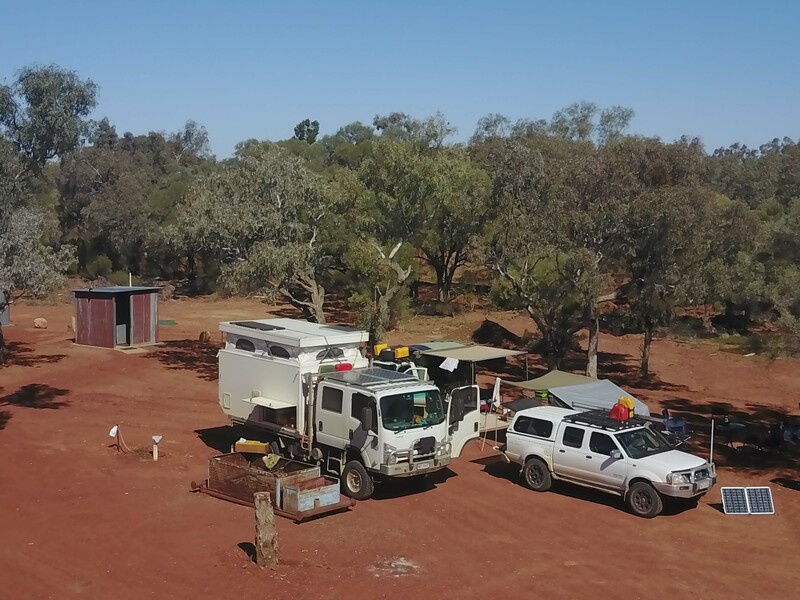 Nearly hit a kangaroo on the way, just a small bump on his rear end sent him on his way, if I had been towing I definitely would have hit him. 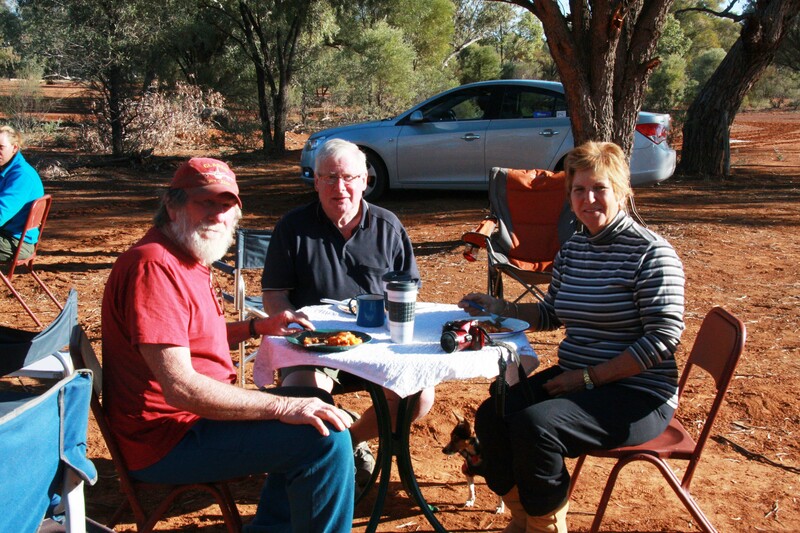 Met a lovely group also staying at Alroy Station, who have just completed a trip up the Canning Stock Route. Not sure I would like to do it with massive corrugations most of the way. Lots of discarded trailers and cars along the way lots with broken chassis from overloading. 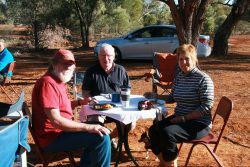 We had a great time around the fire last night and I was invited to breakfast which they cooked. 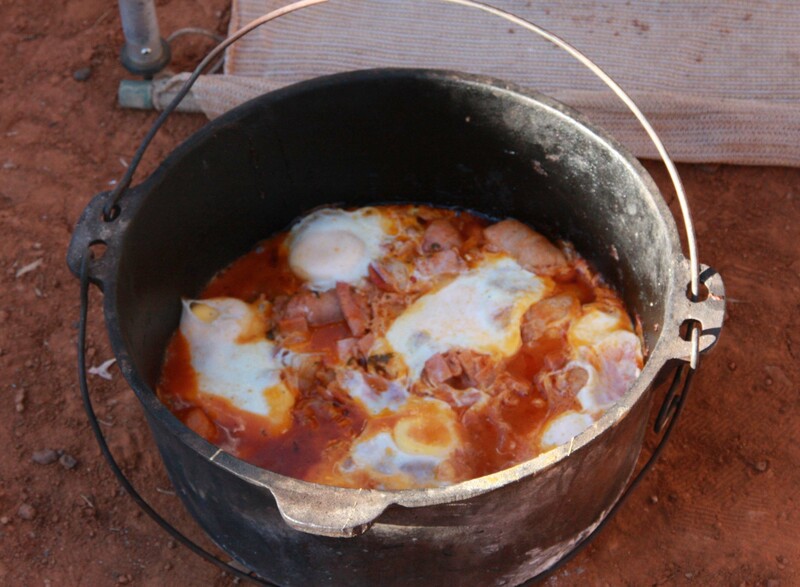 A camp oven of sausages, bacon, tomato, onion and other vegetables plus 8 eggs. It tasted excellent I even didn’t notice the coriander. A goulash was also supplied, to be followed by pancakes, jam and whipped cream. What a breakfast. Then we sat around chatting. 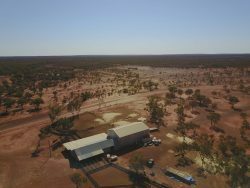 I took out the drone to the shearing shed, which was small compared to others I have visited on this trip, but interesting nevertheless. The country around is so flat and vast just like most of his part of Australia. 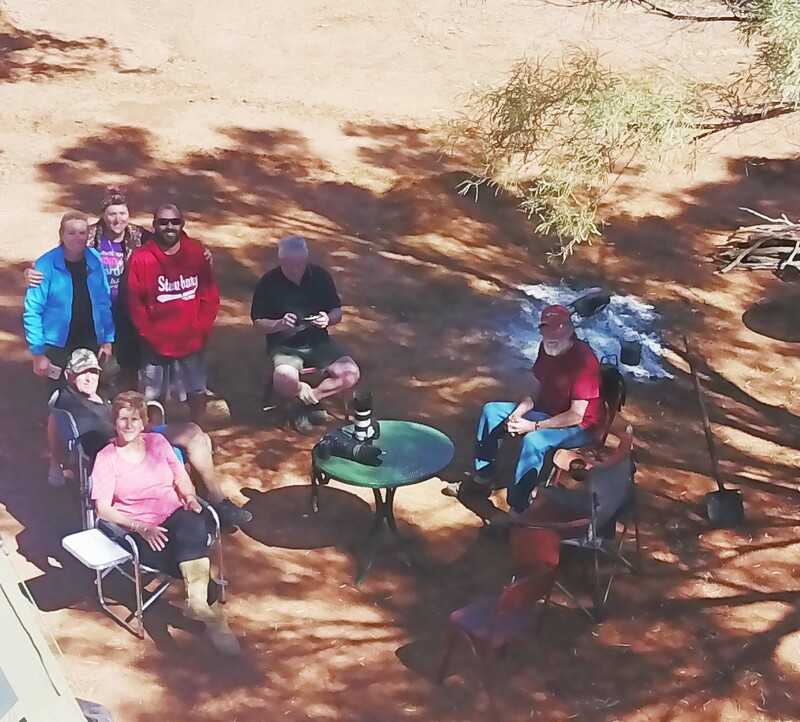 I then showed the group the drone and they were fascinated so I took a photo of us all and of their camp, which I emailed to them. Tomorrow (Monday) I am off to Currawinya National Park for 3 days where I doubt I will have mobile, it is very weak here and I have to use the antenna on my WiFi modem to get enough signal to use the Internet. Sounds Ike the owners have done a great job! The truck with the pop up bit looks unusual. Haven’t seen one likevrhat before. Some wonderful drone-made images there, Russ. The country is astonishing in its vastness and colour. 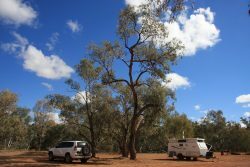 Enjoy your trip to Currawinya National Park. Yes he bought the truck from one person and then the caravan part from another. I think the caravan part was home made, I think it would go anywhere. 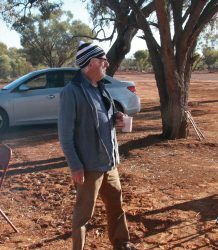 Thanks david, I did enjoy Currawinya the number and variety of birds was amazing, even had a couple of black swans on the waterhole. It was a really peaceful place. 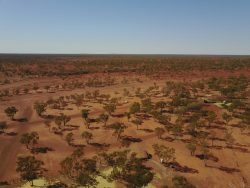 Australia is an amazing place, every time you move on you realise how big it is. Today I travelled about 230Km and passed 3 cars going in the opposite direction.